Over the weekend, Gawker successfully pranked Donald Trump by getting him to retweet a quote from Benito Mussolini. The prank was elegant, damn near perfect, in its simplicity: Ashley Feinberg and Adam Pash put together a Twitter account, using the fascist dictator's nickname Il Duce, and festooned it with blatantly fascist imagery, including a picture of Mussolini himself, with his hair photoshopped in to look like Trump's. (The two men look scarily similar.) They kept up a steady stream of Mussolini quotes, tweeted at Trump, and eventually he bit. As soon as this happened, one thing became inevitable: That some fuddy-duddy out there would, upon sensing that people were enjoying themselves, rush forward to shame us all for taking even a moment of pleasure in this joke. The shame-on-you-for-laughing hot take comes to us from Nathan Robinson at Current Affairs, with a headline that doesn't even try to hide the priggishness of his position. The screenshot illustrates the self-refuting nature of this gambit. It's hard to look at the juxtaposition of that image and that headline and not laugh. Fascists did terrible things and killed millions of people. 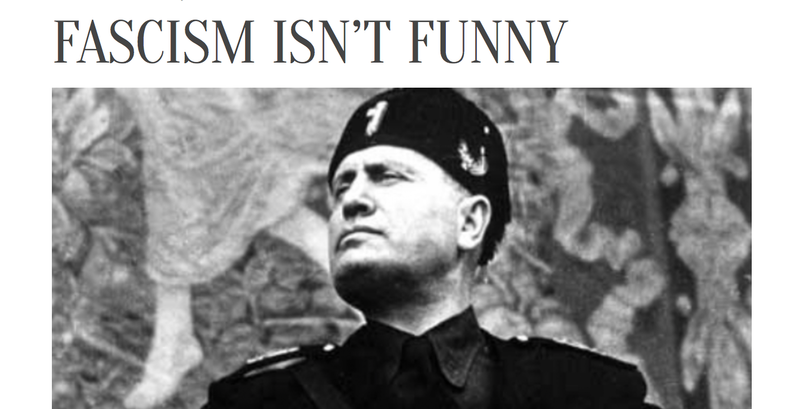 But the self-important puffery of fascists like Mussolini or an off-brand knock-off like Donald Trump has a dark humor to it. They are ridiculous people, made all the more so by how seriously they take themselves. Tacking a self-important "not funny" headline on it just makes the whole thing more absurd. Things do not improve upon actually reading Robinson's scorching hot take. "The question about Trump and the Mussolini quote, then, is: what does it prove?" he intones. "Is it news? And what is the use of pulling this sort of glib micro-stunt?" I don't know? Could it be for fun? Never! This stunt did not happen in the one hour a week set aside for this "fun" you internet people are always jabbering on about. "Those with liberal political sympathies (like the staff of Gawker), who profess to fear a Trump presidency and think him akin to an actual fascist, may want to consider whether this sort of mischief is useful or simply childish," he continues, using the favorite word, "childish", the humorless always use in their efforts to discredit pleasure. "And if it is childish and useless, as one may suspect it is, one may wonder why people on the left are spending their time taunting Trump on Twitter rather than trying to stop the danger they believe he poses to the country." Not to be overly skeptical, but I struggle to believe that stopping for a moment to have a laugh is going to be the difference between our coming fascist dictatorship and preserving freedom. Humorless people have always had this habit of dressing up their tedious character flaw as a virtue. So you might be asking why bother even writing about this one article (besides fun, which is a totally legitimate reason). The answer is that this irritating argument is a conduit for an even more toxic assumption, which is that the reason that Trump is doing so well is that somehow liberals are not doing enough to resist him. That if we just frowned a little harder, crossed our arms a little more firmly, expressed our disapproval with grimness instead of laughter, that would be the silver bullet that would remove the orangey billionaire vampire that plagues us. Robinson argues that "it’s very likely that, far from successfully undermining or humiliating Donald Trump," laughing at Trump will "enable him to grow even stronger." OK, and so you think frowning really hard at him will make a difference? For evidence against that supposition, I will drag out the freshly interred corpse of the Jeb Bush campaign. For most of the Bush campaign, the strategy was to do what Robinson is doing here, hoping that, by taking enough self-serious umbrage at Trump's antics, Bush could kill off the Trump campaign. How'd that work out for him? Jeb took the high road for most of the past calendar year, but Trump used his gentlemanly dignity against him. What Trump understands better than his opponents is that NASCAR America, WWE America, always loves seeing the preening self-proclaimed good guy get whacked with a chair. It's almost like making someone seem ridiculous can help undermine them! But no, Robinson, in the grand tradition of humorless people everywhere, views pleasure as a sapping force, on that inherently weakness those who enjoy it, making them unable to fight. But, as Jeb Bush can tell you, playing the grim prig to Trump's insult comedian is literally the worst possible way to handle him. Trump's entire schtick is that he's going to free the masses from the yoke of humorless political correctness, and so insisting that pleasure is forbidden is playing right into his hands. Pranking Trump won't derail him. But neither will frowning really hard at him. Or calling him a poopyface. There isn't some magic formula that will kneecap the Trump campaign. That's because Trump and his supporters are, and I know this is painful to deal with, autonomous people who make their choices for reasons of their own. They like his message of racial resentment, and you aren't going to be able to manipulate them out of it. And you sure as hell aren't going to be able to finger-wag them out of it, because they will just laugh at you and call you "politically correct". What can be done is continually highlighting how unfit Trump is to be President, with an eye towards encouraging people who don't like Trump to make a point of voting against him. To that end, Gawker proved their point. They showed that Trump is so careless that he just retweets someone who flatters him, even if that person literally tweets with a picture of Mussolini as a profile pic. You don't need to literally spell out that such a person shouldn't have the nuclear codes in order to drive the message home. Sure, you can make that same point in the Robinson-approved way, by insisting there is nothing funny about it and hoping people are motivated by shame and guilt into listening. But, due to that well-known part of human nature that prefers laughing to crying, it's more effective to make the point with humor.